Pike and Shot To Impact and Salvo – Warfare 1550-1815: WILLIAM ALEXANDER (1726–1783). Continental officer and claimant to the title of Lord Stirling. William was the son of James Alexander (1691–1756), a prominent New York lawyer, and Mary Sprat Provoost, a merchant. Growing up in privileged circumstances, he received a good education from his father and private tutors and became a proficient mathematician and astronomer. He was associated with his mother in her mercantile business. In 1748, he married Sarah Livingston, daughter of Philip Livingston, thus securing a close connection with the wealthy and powerful Livingston family of New Jersey. At the start of the Seven Years’ War, he joined the military staff of Governor William Shirley of Massachusetts as his secretary. In addition, he and some business partners were hired as army contractors during the Niagara campaign of 1755 and 1756. His connections with Shirley proved to be a liability when the governor failed as a military leader, for Alexander and his partners were accused of profiteering. In 1756 he accompanied Shirley to London, where he defended his mentor’s reputation and fought successfully to clear his own name. Alexander lived in Britain from 1757 to 1761, hobnobbing with land-owning gentlemen and spending money in pursuit of the lapsed Scots earldom of Stirling. He got the Scots lords to accept his claim to the title, but not their English counterparts. Undeterred by this rebuff, he assumed the title, and his American contemporaries thereafter called him lord Stirling. Upon his return to America, he gave up his previous occupation of merchant. Building an elegant country house near Basking Ridge, New Jersey, he lived there with his family in emulation of the English landed gentry. He dabbled in science, invested in iron mining, speculated in land, drank to excess, and squandered a fortune of more than £100,000. He served on the councils of New York and New Jersey and the Board of Proprietors of East Jersey. He also held the post of governor of King’s College (later Columbia University). As tensions grew between America and Britain in the 1760s and 1770s, Alexander expressed pro-parliamentary views. On one occasion he even urged the Board of Trade to tighten its enforcement of navigation and tax laws in the colonies. When the war with Britain began in 1775, however, Lord Stirling quickly declared for America and never wavered thereafter. The royal governors of New York (William Tryon) and New Jersey (William Franklin) removed him from their councils. He was appointed a member of the extralegal Council of Safety in New Jersey, and on 1 November 1775 was commissioned as a colonel of the First New Jersey Regiment. He assisted in the seizure of an armed British transport, the Blue Mountain Valley, on 25 January 1776, and was rewarded with promotion to brigadier general on 1 March. Assuming command at New York City, he directed the construction of defensive works in preparation for a threatened British invasion. In April he welcomed General George Washington to the city, and soon developed a congenial association with the commander in chief. He confronted his first big test as a military leader on 27 August 1776, when Washington gave him command of the American right wing in the battle of Long Island. Through no fault of his own, his brigade was overwhelmed and he was captured. Stirling was included in a prisoner exchange on 6 October 1776. Rejoining Washington’s army on Manhattan, he was given command of another brigade. He operated in a semi-independent command over the next two weeks, retreating with the rest of the American army to White Plains, New York. There, on 28 October, he participated in a pitched battle before joining in a fighting withdrawal across New Jersey in November and December. At Trenton on 26 December he played a major role in the defeat of a Hessian garrison commanded by Colonel Johann Räll. 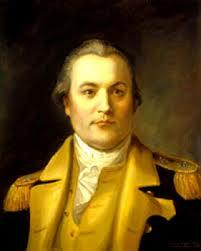 On 19 February 1777 he was one of five American officers promoted to major general. He took up his post with his division near Metuchen, New Jersey, on 24 June. Two days later he was assaulted by a superior enemy force commanded by Lord Charles Cornwallis and was given a severe mauling before he extricated himself from his dangerously exposed position. Retaining Washington’s confidence, he served in the Hudson Highlands for a short time before rejoining the main army and marching into Pennsylvania. He commanded well in the battle of Brandywine on 11 September, rushing his division to the support of John Sullivan when Sullivan was attacked near the Birmingham Meeting House. In the battle of Germantown on 4 October, Stirling’s division was in the thick of the fight. After spending the winter of 1777 and 1778 at Valley Forge, Stirling accompanied the American army in mid-June 1778 as it followed the British forces withdrawing from Philadelphia across New Jersey. In the battle of Monmouth on 28 June he played a key role in the American victory by deploying cannon to good effect in the third and final line of defense. For almost two hours, he cannonaded the enemy, with the British reciprocating in kind. Breaking up a British infantry advance, he then ordered his own men to assault the enemy’s right flank. As the redcoats broke into flight, he wisely ordered his soldiers not to press the pursuit. From 4 July to 12 August he presided over the court martial of Charles Lee, who was subsequently suspended from the army for one year. In the summer of 1779 he assisted Major Henry Lee in the latter’s brilliant assault on Paulus Hook, New Jersey. On January 14 and 15, 1780, he led a mismanaged, abortive raid on Staten Island during a period of cruelly cold weather. Later that year he served on a board of general officers that inquired into the activities of John Andre´. Given an independent command at Albany in 1781, Stirling prepared to defend Fort Ticonderoga from a possible British attack. No attack materialized, and his duties were easy. He died of a virulent and painful attack of gout on 15 January 1783. Although not a brilliant soldier, he was loyal, trustworthy, reliable, and brave. His loss was mourned by Washington, his fellow officers, and his family. BIBLIOGRAPHY Duer, William Alexander. The Life of William Alexander, Earl of Stirling: Major General in the Army of the United States, during the Revolution. New York: Wiley and Putnam, 1847. Nelson, Paul David. William Alexander, Lord Stirling. University, Ala.: University of Alabama Press, 1987. Schumacher, Ludwig. Major-General the Earl of Stirling: An Essay in Biography. New York: New Amsterdam, 1897. Valentine, Alan. Lord Stirling. New York: Oxford University Press, 1969.